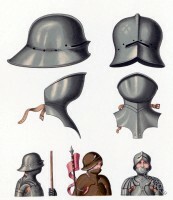 Home » Cuirasses. Waterloo battle 1815. The Battle of Waterloo at Sunday, 18 June 1815. In Paul’s Letters Sir Walter enters into further details as follows: “The great object of ambition was to possess the armour of a cuirasseer, which at first might have been bought in great quantity, almost all the wearers having fallen in that bloody battle the victors have indeed carried off some of these cuirasses, to serve as culinary vessels, and I myself have seen the Highlanders frying their rations of beef or mutton upon the breast-plates and back-pieces of their discomfited adversaries. But enough remained to make the fortunes of the people of St. John, Waterloo, Planchenoit, etc. When I was at La Belle Alliance I bought the cuirass of a common soldier for about 6 francs, but a very handsome inlaid one, once the property of a French officer of distinction, which was for sale in Brussels, cost me four times that sum. As for the casques, or head-pieces, which by the way are remarkably handsome, they are almost introuvable. For the peasants almost immediately sold them to be beat out for old copper; and the purchaser, needlessly afraid of their being reclaimed, destroyed them as fast as possible. “The steel cuirass measures 3 feet 2 inches round the waist, and 3 feet 6 1/2 inches round the chest. 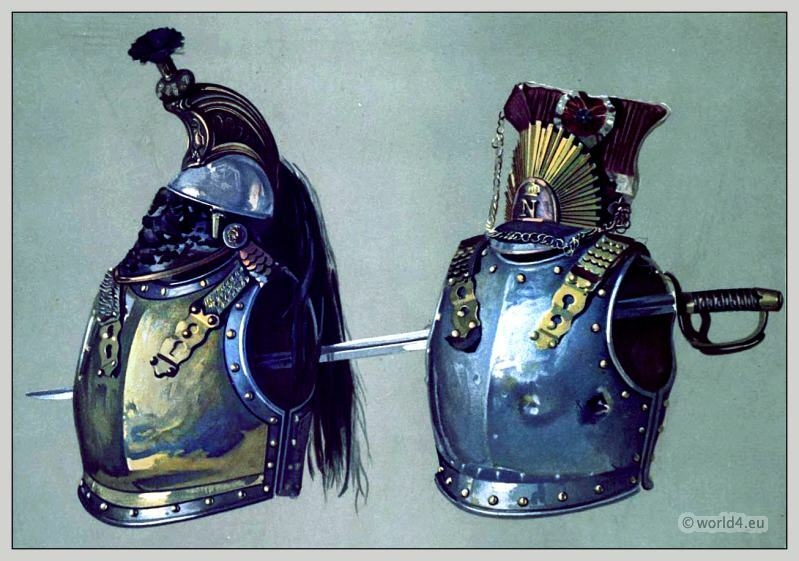 The brass cuirass is 3 feet 3 1/2 inches round waist, 3 feet 6 3/4 inches round chest. The sword-blade measures 38 inches in length, the breadth at hilt 1 1/2 inch, and the hilt itself 6 3/4 inches. The grip is covered with black leather bound with brass wire. The guard is formed of flat brass bands. The helmet measures 16 inches in height, and 8 inches from back to front. The upper half of the helmet is of bright steel, with the crest in brass, and is highly ornamented at the side with foliage and fluting. The horse-hair plume is about 2 feet in length. 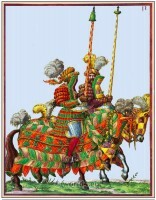 Knights in armor riding to a tournament. 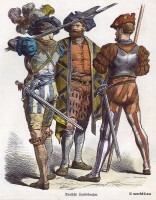 16th c.
Pierre du Terrail, Chevalier de Bayard. 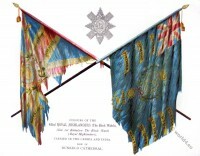 Flags of the Royal Highlanders. The Black Watch.